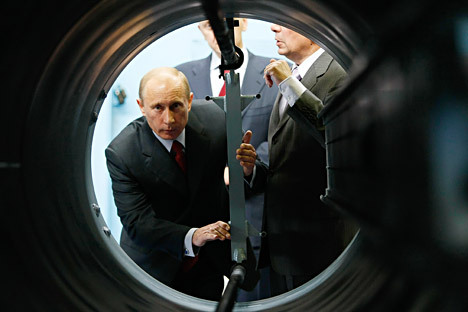 Vladimir Putin visiting the Almaz-Antei Air Defense Concern, July 28, 2008. Russia is now a world leader in development and production of anti-aircraft missiles. The S-300 and S-400 systems are unrivalled and, if needed, able to take out even Stealth bombers. Such lethal air defences were difficult to imagine, when conceived 70 years ago. The Second World War demonstrated, irrevocably, that artillery had lost its primacy in the combat space, rendering it unable to compete with the far greater range and effectiveness of the rapidly developing aviation technology. Not willing to leave primacy of the skies to the vagaries of training and skill of human pilots, western defence forces began to develop unmanned missile-based anti-aircraft weapon systems. In the Soviet Union, this work began during the war years, led by engineer Sergo Beria, son of Stalin's Commissar of Internal Affairs Lavrenty Beria. Beria Jr.’s project was successful; in 1951, using secret facilities, the team was able to create a flying projectile that could pierce a sea cruiser’s armour. In the aviation arena, meanwhile, it was becoming apparent that it was impractical to try and build elaborate fixed defensive lines against conventional bombers, since one nuclear charge could destroy an entire city. The construction of a defensive system to secure Soviet cities from even a single enemy plane thus became a priority, and missile systems were the key. The government decided to protect Moscow with two rings of air defence missile systems, connecting them with concrete roads for the transport of a new type of missile that pinpointed targets using radar and used missiles fitted with a warhead to destroy them. Development and testing of such a system took five years before the first Soviet anti-aircraft missile system, the S-25, was deployed into service in 1955. No world army had anything like this new weapon, which could hit targets flying at supersonic speeds at altitudes of up to 20 km (65,600 feet). It was no mean feat to create such a system, and transformed and elevated Beria’s small design office into a large-scale enterprise with thousands of employees on the job. As formidable a weapon as the S-25 was, it still required a mobile system that could be easily moved and hidden in order to roll out a protective shield across the territory of the Soviet Union. The result was the S-75, the appearance of which caused a revolution in the science of aerial warfare. In 1960, the system’s first missile fired in anger hit and downed the U-2 U.S. spy plane over Sverdlovsk, leading to the capture of pilot Francis Gary Powers. The weapon also inflicted heavy losses on the U.S. Air Force in Vietnam after the North Vietnamese deployed large stocks of the Soviet-supplied missiles by hand into the jungle. These were used to destroy more than 2,000 U.S. combat aircraft. In 1962, the S-75 was also shipped to Cuba to cover the planned but later aborted deployment of Soviet nuclear missiles on the island. In order to evade Soviet air defense system radars, enemy aircraft began to operate at extremely low heights, a tactic that resulted in the development of a new combat system, the S-125. In 1967, employees of the design bureau founded by Beria developed the next-generation air defense system, the S-200, which was capable of hitting targets at a range of more than 200 km (125 miles). A small number of mobile systems could now cover vast areas if correctly placed. A landmark achievement of the Beria enterprise, which was named the Almaz (“diamond”) design bureau in 1977, was the S-300. Adopted by the Soviet Army in 1979, the system is still the leader in its field today, with its radar enabling the user to pinpoint targets at up to 300 km (200 miles) and simultaneously fire on more than 30 objects. Its successor system, the S-400, has even more impressive capabilities, able to combat the Stealth aircraft deployed by the United States. In 2008, the Almaz-Antey joint stock company was created by combining all of the enterprises involved in the development and production of air defense missile systems. The company’s engineers are now working on a fifth-generation anti-missile system that will be able to eliminate targets in near space, including ballistic missiles. Today the company’s large volume of exports cements its place among the enterprises of the Russian military-industrial complex. Almaz-Antey fulfilled 28 contracts with 11 countries in 2014, and in February this year reportedly had more than $200 million worth of orders in its ledger.